So, things have been rather busy here, and one reason is because Mr. Phil has been in a cast for four weeks now. 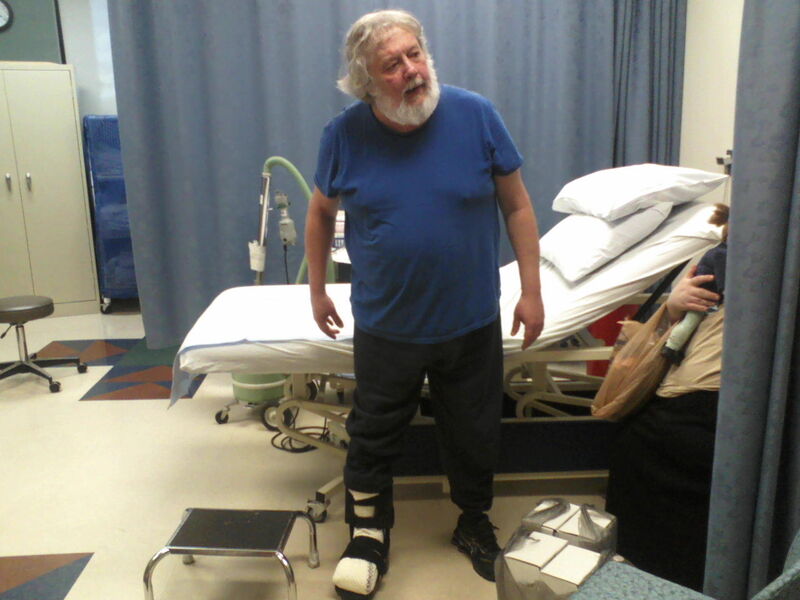 He had a simple little injury to the ball of his right foot that refused to heal, and turned into a somewhat complex injury. Because of the location, on the bottom of his foot, walking on it only aggravated it further, until he ended up at the Wound Center of the hospital. And thankfully so, because the doctor and nurses there are amazing. They are kind, gentle, sweet-natured, funny, and their genuine caring shows in their attention to the patients week after week. Yes, week after week. 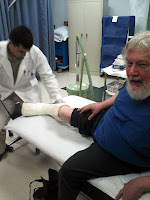 Every Tuesday for the past month we’ve been going there so Phil can have his cast removed, the wound examined, and a new cast put on. And heal it certainly has! 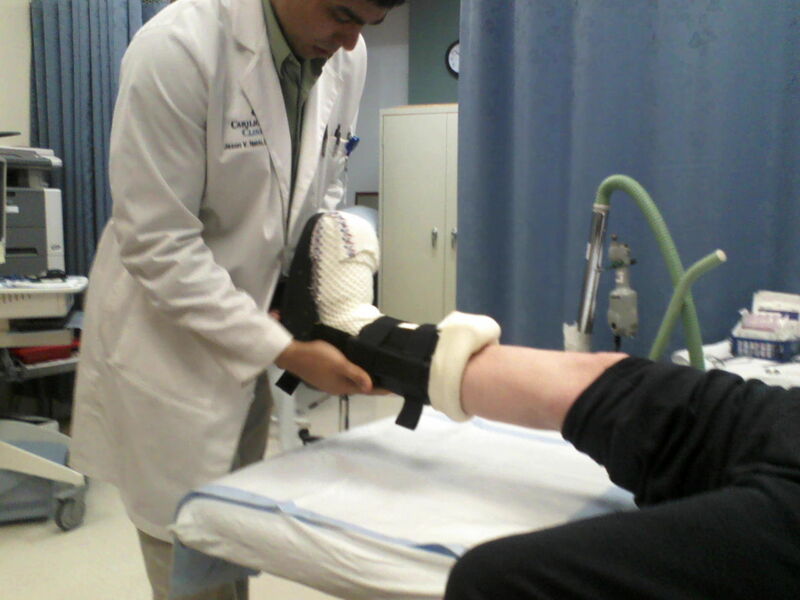 The doctor and nurses are thrilled with how well Phil’s foot has healed. The photographs they take to document are really amazing and interesting. Alas, I felt they were too graphic for here. 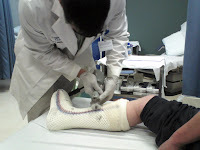 Dr. Naldo cuts off the old cast using a rotary blade that merely vibrates; it doesn’t rotate at all. 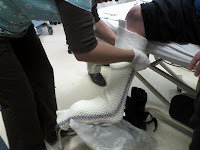 A thick knitted stocking is put on next, the extra draped over the top of the foot. It is never draped under, because they want the bottom of his foot to have as equal pressure on the entire surface as possible to allow the wound to heal. 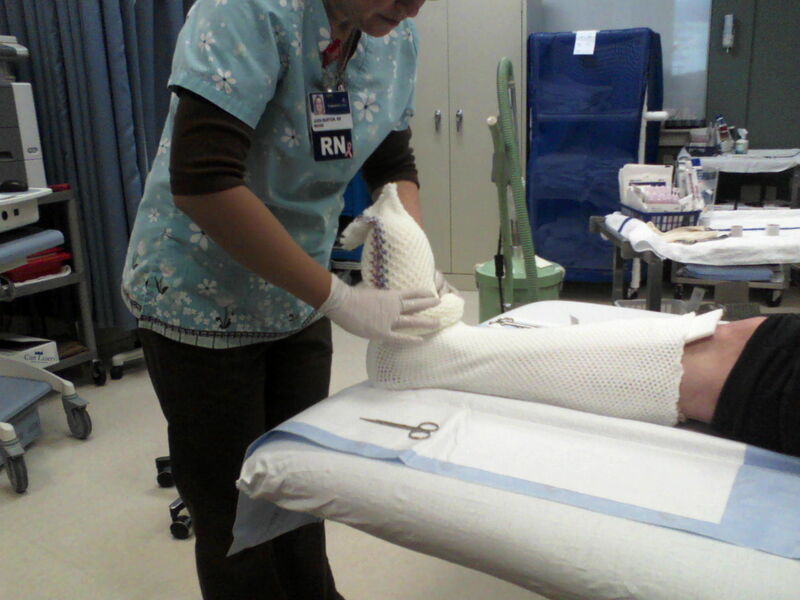 And finally, a very thick knitted sock cast is the last layer in this cast set. It is wetted to activate the chemicals in it that will harden it, then rolled onto the foot and leg. 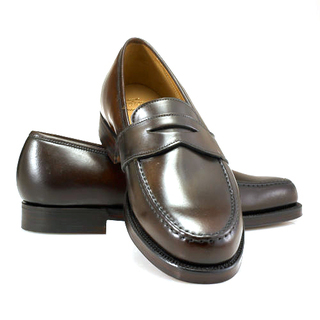 They pull it up to about three inches below the top of the under padding materials. You can hear it sizzling from the chemical reaction of the water and cast components. 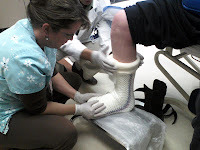 Nurse Jada folds the excess over the top of Phil’s foot and smoothes it down, while Dr. Naldo pulls the top of the padding down over the top of the cast. And Phil waits for it to dry. 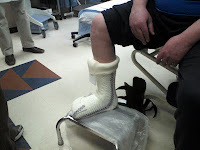 His foot must be kept at a 90° angle for the purposes of keeping the pressure on the bottom of the foot equal, and also to make it possible to walk on the cast with the “boot” on. After about ten minutes Phil can lay down for the cast to finish drying. 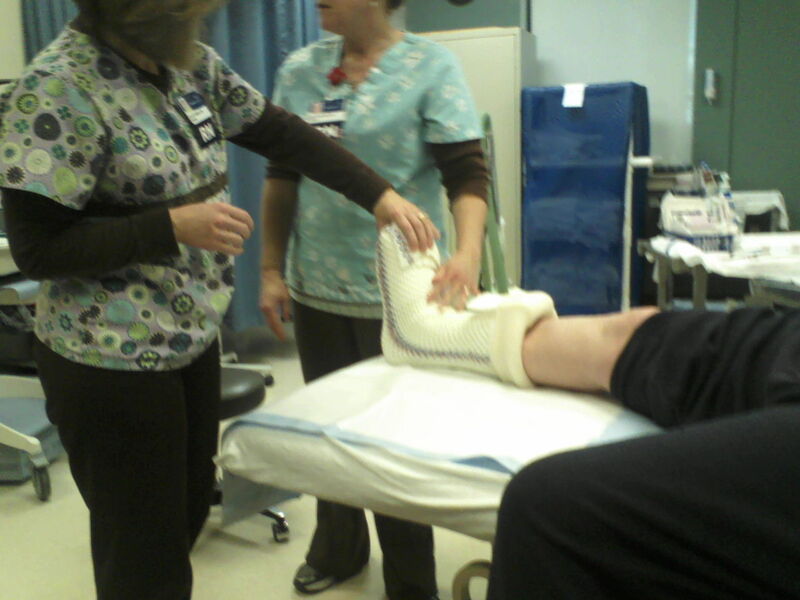 The chemical reaction from wetting the cast makes it grow very warm at first. As it dries, it will cool. 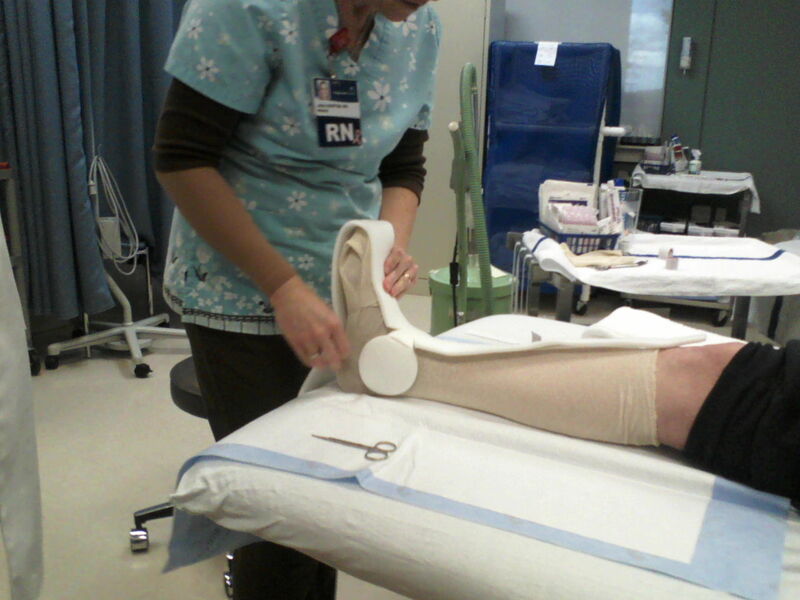 Nurse Jada and a new nurse just learning at the Wound Center check to see how hard and cool it is. Not done yet. Another ten minutes or so. 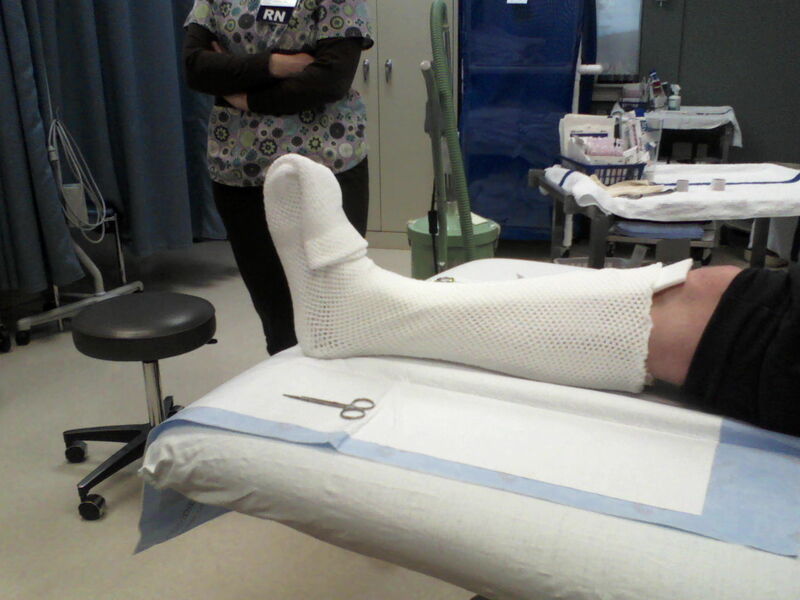 The cast is now hard as a rock. Dr. Naldo chats with us as he puts Phil’s cast boot back on. Yes, see you next week! 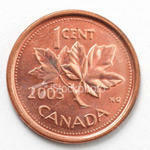 Well, I heard that last week Canada decided to phase out and discontinue their penny. The reason given was that it wasn't worth the cost of producing them, and apparently, it costs 1.6 cents to make a penny, so yeah, I can see where they’re coming from. And I wonder if the US will bring the issue up again and follow suit. But that got me to thinking, what would happen if we did get rid of the penny? What will happen to penny loafers? Will a nickel even fit into that diamond-shaped slit on top? Would a dime be too small and fall out? Will we sing “Nickels From Heaven?” You can imagine pennies raining down from heaven might sting a little, but I bet those dang nickels will sure leave a mark! What about the phrase “In for a penny, in for a pound?” Will we change it accordingly? “In for a nickel, in for five pounds.“ What exactly would it be 5 pounds of? A bag of sugar? Or the current US equivalent of the British currency, which would amount to $9.70? Would girls named Penny need to be renamed? 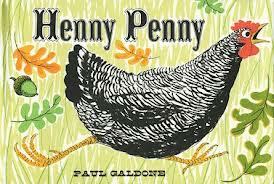 I mean, take Henny Penny, for example. Henny Nickel does NOT rhyme. If you think she was wired a little too tight thinking the sky was falling, having that moniker may just land her a room in the nearest psych ward. Well, at least we don’t have to worry about penny candy. Inflation took care of that for us years ago. I can remember my siblings and I each being given a quarter to spend at the penny candy store uptown in Wrentham, where I grew up. We took our time picking and choosing just what we wanted, and came out with a little brown paper bag filled with treasured goodies: Mary Janes, Squirrel Nuts, Mint Juleps, candy lipsticks, dots on paper strips, BB Bats, Flying Saucers, Pixie Stix, wax bottles…. I’ve long ago recovered from the shock of what we pay today for “penny candy” at the few country stores that still sell it. I've adjusted. I guess, if we do lose our penny, we’ll just have to find the means to accept it and go on with our lives. It ended up being finished rather quickly, so instead of leaving it to post later, I went ahead and chose the photos for it, arranged it all, previewed it 47 times and made changes, etc. It was a fun post to write, and it seemed to come together so fast. Then I was hungry, so on the way into the kitchen to rustle up some breakfast, I heard one of The Baker’s Dozen, our small cat herd, ringing the doorbell. They really can. When they want to come inside again, they jump up onto the ledge of the window right next to my bed. I seriously don’t know how they can do that and stay there, because I don’t think that ledge is even 2 full inches wide. 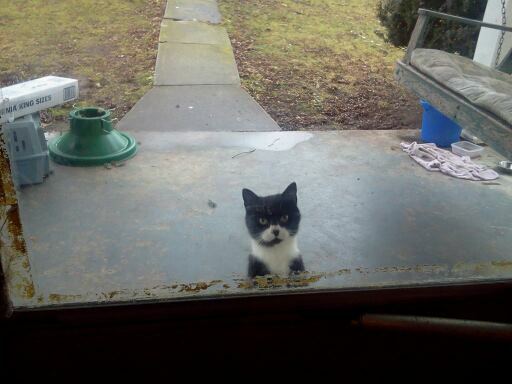 I went to the door to let the little muskrat in, and our stray, Teddy, was at the door also, meowing because he was hungry. I keep a little container of cat food right near the door just for filling Teddy’s dish on the front porch, but it was empty, so I filled the little container from the large container we have for the rest of The Baker’s Dozen. Only the second the rest of them heard that distinctive sound of kibbles hitting plastic, I was surrounded by a moving sea of black and white. Out of the twelve indoor cats, we have 4 solid black and 4 black with white bibs and paws. So when they're all together, it gets hard to tell where one cat ends and another begins. I knew if I opened that front door even a crack to go fill Teddy’s bowl, they’d bolt out and pounce on his food like a monkey on a cupcake. So I took the large container of dry food into the kitchen, where we have big round plates that seat four cats at a time. Well, they’re really old plastic lids from some big mixing bowls. At any rate, I filled their plates and told them, unnecessarily, that their tables were ready, then went back to take care of Teddy. When I went to open the outer glass door, Teddy reached up to stretch and put his paws on the glass, showing me his wee little jellybean toes. It was so cute, I wished I had a picture of it, but of course I didn’t have my camera on and it happened too quickly anyway. As I stepped out, Teddy meowed repeatedly and stayed within inches of me, instead of running off or backing away several feet. I talked to him while I was pouring the food into his dish and exchanging his bowl-shaped ice cube for a new bowl of water, and he did the Dance of Hunger at my feet. I watched him for a few moments and then went to the kitchen, where I made my English muffin with cottage cheese and wrestled with a package of cream cheese for Phil’s bagel.